Eutrophication has become a global aquatic environmental problem because of its ecological consequences, such as frequent outbreaks of algal blooms threatening the reliable supply of drinking water. Eutrophication increases biological oxygen demand (BOD) of water, release toxic gases, encourage profuse growth of aquatic weeds and all these have adverse effects on fish growth, fish spawning, domestic use and even navigation. Eutrophic water favours the growth of disease causing agents of health hazards. The enhancing rate of deposition of silt and organic debris in the eutrophic water body makes the water body slowly becomes shallower and shallower and as a result the water body slowly transforms into a wetland and finally converts into a dry land which ultimately leads to water crisis of the environment. As eutrophication is a global aquatic environmental problem, so currently our attention at the global level is how to minimize eutrophication through sustainable management of conservation of water resource. Minimization of eutrophication requires holistic efforts of some parameters such as physico-chemical factors of water should be analysed regularly, developing phosphate-free detergents for domestic use, removal of algal bloom by dredging, reducing the excessive use of fertilizers in the agricultural practices, mechanical aeration, effective waste water treatment etc. Recent research shows that climatic factors have profound impact on eutrophication. When the nutrient load is reaching a constant level in water bodies, increasing temperature, precipitation, wind speed and solar radiation from sunlight are generally expected to increase the risk of water eutrophication. Therefore, it infers that even if the external sources of nutrients are controlled by implementing governance measures, such as the control of waste discharges and non-point pollution, under climate change water could still become eutrophic due to the release of nutrient loading from internal sources. Algal bloom, Water quality, Health hazards, Climatic factors, Water crisis. Water, one of the important natural resource of environment is essential for sustaining the life of all living organisms including man. We need pure water (potable water) which should contain sufficient dissolved oxygen, free from harmful chemicals, disease causing microbes (pathogens) and suspended impurities. Unfortunately, indiscriminate and unmanageable application of excessive amount of fertilizers in agricultural practices, dumping of enormous amount of domestic and industrial waste materials into the water bodies leads to a severe ecological problem in environment viz., Eutrophication. From ecological point of view eutrophication can be defined as the excessive nutrient load in a water body or enrichment of water body by nutrients . From physico-chemical point of view eutrophication denotes the lowering or deterioration of water quality for domestic, recreational and other uses . Eutrophication has become a global aquatic environmental problem because of its ecological consequences, such as frequent outbreaks of algal blooms threatening the reliable supply of drinking water. It may result in oxygen depletion of the water body. A number of noteworthy researchers worked on the eutrophic water body [3-9]. Recent research has indicated climate change as a major natural factor that will lead to the acceleration of eutrophication in rivers and lakes [10-17]. This review collects the existing international and national literature to gain a comprehensive understanding about eutrophication and how climate change factors could affect the occurrence of eutrophication in freshwater ecosystem. When the water body becomes eutrophic, dense population of planktonic algae develops which commonly known as algal bloom or plankton bloom (Figure 1). Development of algal bloom by Anabaena, Fragilaria, Melosira, Microcystis and Oscillatoria were observed in such eutrophic water during study period [1,5]. Plankton bloom when exist under abundant sunlight, they contribute oxygen to the water through photosynthesis, but under prolonged cloudy weather, they begin to decay and consume more oxygen than they produce leading to oxygen depletion of water. Figure 1: Photograph of a eutrophic water body in Sonamua, Tripura. Moreover, decomposition of organic wastes by bacteria also required oxygen and with heavy loads the oxygen value of water may diminish below the point where most aquatic organisms and particularly fish the man’s most edible thing cannot survive. Several noteworthy researchers opined that plankton bloom in eutrophic water may often increase the biological oxygen demand (BOD) of water which reduces the amount of dissolved oxygen available for fish and other aquatic organisms which in turn disturbances the aquatic food-chain [18,19]. In eutrophic water, BOD value often rise to more than 50 ppm while water for drinking should have BOD less than 1. Researcher opined that under eutrophic condition toxic gas (H2S) that emanates from the rotting algae creates unpleasant smell in the water thereby reducing its acceptability as a domestic use . Researchers are of the opinion that in eutrophic water, excessive growth of aquatic weeds (Eicchornia crassipes, Lemna, Myriophyllum, Trapa bispinosa) takes place which in-turn impair fishing, bathing, fish spawning and even navigation [21,22]. Several researchers are of the opinion that chemically, eutrophic water is rich in nitrate-nitrogen and phosphate-phosphorus [3,4,8]. Nitrates (NO3-) released from nitrogenous fertilizers get converted into nitrites in this eutrophic water. When we take nitrite contaminated water, it then reacts with haemoglobin of blood forming methaemoglobin which hampers oxygen transporting ability of blood which in turn leads to laboured breathing and occasional suffocation in human beings. Nitrites (NO2-) causing a bluish discoloration of skin of infant and is commonly referred to as “blue baby” syndrome. Nitrites may also react with creatinine present in vertebrate muscle to form nitrosarcosine which can be carcinogenic. Phosphorus released from phosphate fertilizers as well as detergents helps algal growth, resulting in enormous blooms. In super phosphate, the phosphorus are in the form of tripolyphosphate (P3O105-). This tripolyphosphate through surface run off from agricultural fields when get entry into the aquatic body, it then slowly reacts with water forming orthophosphate (PO43- ) which results algal bloom. It is observed that phosphate phosphorus in the range of 0.7 – 0.8 ppm and nitrate nitrogen in the range of 0.6 – 0.9 ppm are sufficient to cause algal bloom. Experimental studies of the researchers reveals that water polluted through various agent becomes eutrophic in nature where marked changes occur in the chemical parameters of water [3,7-9] (Table 1). Aquaculturist reported that oxygen value of water range from 2-3 ppm in eutrophic water body while normal environmental condition, the oxygen value of water ranges from 6-10 ppm . Table 1. Chemical characteristics of water under eutrophic condition. Researcher opined that fishes are generally attacked by fungal pathogens in water bodies with abundant decaying organic matter which can be seen as tufts of whitish thread outgrowths . Several noteworthy researchers are of the opinion that the particulate organic matter causes clogging of gills of fishes [19,25]. As a result, mortality of fishes takes place due to suffocation (Figure 2). 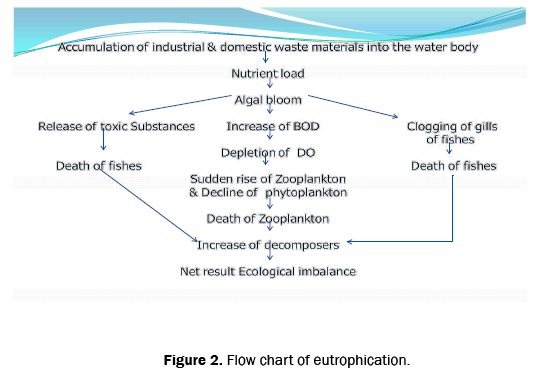 Figure 2: Flow chart of eutrophication. Eutrophic water is the habitat of various disease causing agents (Pathogens) like bacteria, protozoa and virus. While using this Eutrophic water, human beings get attacked by a number of water borne diseases like typhoid, cholera, dysentery, diarrhea etc. Malaria, Dengue etc., are caused by the mosquitoes that breed in stagnant and polluted water. Researcher has estimated that 10 million deaths resulted from 25 million new cases of water-related diseases reported annually and that half the world population suffered from infection caused by polluted water . The enhancing rate of deposition of silt and organic debris in the water body, makes the water body slowly becomes shallower and shallower [1,2]. As a result the water body slowly transforms into a wetland and finally converts into a dry land. Thus a water body which is so useful for us becomes totally useless within a short span of time due to anthropogenic activities increasing water requirements, its limited supply and eutrophic condition of water leads to water crisis of the environment. 1. Water quality parameters should be analysed regularly. 2. Developing phosphate –free detergents for domestic use. 3. Removal of algal bloom frequently by dredging. 4. Reducing that excessive use of fertilizers in the agricultural fields. 5. Where oxygen depletion is a serious concern, mechanical aeration may help. 6. Effective waste water treatment is necessary. 7. Application of appropriate doses of copper sulphate and sodium arsenite which can minimize the growth and multiplication of algae and macrophytes. The sensitive climate change factors which have profound impact on eutrophication are identified and analyzed in order to find out the interaction between climate change and eutrophication in terms of the water temperature, precipitation, wind and solar radiation (Figure 3). 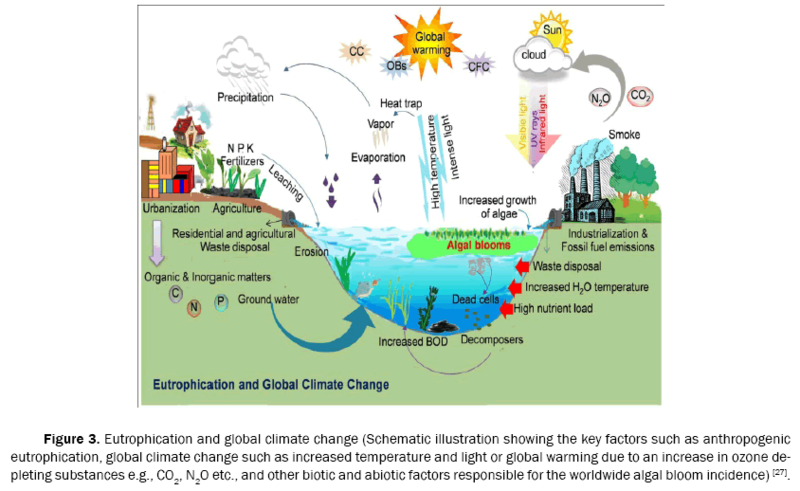 Figure 3: Eutrophication and global climate change (Schematic illustration showing the key factors such as anthropogenic eutrophication, global climate change such as increased temperature and light or global warming due to an increase in ozone depleting substances e.g., CO2, N2O etc., and other biotic and abiotic factors responsible for the worldwide algal bloom incidence) . Under the framework of climate change, increasing air temperature will influence the water temperature as well as the physical and chemical properties of water including water pH, salinity, solubility and diffusion rates. Research shows that the growth rates of freshwater eukaryotic phytoplankton generally stabilize or decrease while the growth rates of many cyanobacteria increase providing a competitive advantage when the temperature is around 20°C [17,28]. Once the temperature rises above 25°C, it can directly promote an increasing growth of cyanobacteria compared to other phytoplankton groups, such as green algae and diatoms in the water body [16,29]. A recent study shows that higher temperature will increase microbial activity in the sediments and soil at the bottom of lakes and rivers, thereby accelerating the release rate of internal Phosphorus (P) loading, which may contribute to a significant portion of the total nutrient load in the water . The change in rainfall intensity will release higher concentrations of sediment through erosion and re-suspension. Intense precipitation events more mobilize nutrients on land by gathering more non-point pollutions and increasing the nutrient enrichment of receiving waters. Less precipitation could result in lower minimum flows, implying less volume for dilution in water. A reduced dilution effect and degradation coefficient will impact the organic pollutant concentrations with lower concentration of dissolved oxygen (DO) and increased biochemical oxygen demand (BOD) in water systems potentially increasing the risk of eutrophication . Wind will have direct and indirect impacts on water Eutrophication. The direct effects of wind refer to algae blown in from the lake to the lakeshore forming algal blooms . The indirect effect caused by wind-wave disturbance accelerating the release of nutrients from sediments in water . The wind-induced and sediment distribution could also play an important role in the spatial distribution of the algal blooms but wind intensity will probably restrains the formation of algal blooms [10,31]. Under normal circumstances, sunlight provides optimal conditions for the growth of algae leading to an increase in water temperature, thus further influencing the growth of phytoplankton and increasing the risk of water Eutrophication. Recent reports have also indicated that there was a direct correlation between the distribution of algae and the intensity of illumination at different depths . Large anthropogenic inputs of phosphorus and nitrogen from a range of societal sectors and agricultural land have been recognised as the prime cause of eutrophication in water. However, when the nutrient load is reaching a constant level in water bodies, increasing temperature, precipitation, wind speed and solar radiation from sunlight are generally expected to increase the risk of water eutrophication. Therefore, it infers that even if the external sources of nutrients are controlled by implementing governance measures, such as the control of waste discharges and non-point pollution, under climate change water could still become eutrophic due to the release of nutrient loading from internal sources. It is obviously true to the fact that water is the central of existence of all forms of life on the earth and we also cannot imagine a world without water for there is no substitute for water. Hence, there is urgent need for conservation of this valuable natural resource of our environment. Such a target has been achieved only by the practice of sustainable use of water that satisfy the changing human needs without eroding the ecological status of the said natural resource of the environment. The author gratefully acknowledges Prof. S. Banik, Department of Zoology, Tripura University for his valuable suggestions and constant inspiration besides constructive criticism. The author also expresses his deepest sense of gratitude and obligation to Dr. B.K. Ray, Principal, Kabi Nazrul Mahavidyalaya, Sonamura, Tripura for his encouragement. Hutchinson GE, et al. Eutrophication: Causes, consequences, correctives. National Academy of Science, Washington D.C., USA. 1969:12-26. Harper D, et al. Eutrophication of freshwaters. Chapman and Hall, London. 1992. Vollenweider RA. Scientific fundamentals of the Eutrophication of Lakes and Flowing waters with special reference to nitrogen and phosphorus as factors in eutrophication. Technical report Organisation for Economic Co-operation and Development, Paris. 1968:1-250. Kumar HD, et al. Zirconium induced precipitation of phosphate as a means of controlling eutrophication. Aquatic Botany. 1978;4:359-366. Bell PRF, et al. Ecological indicators of large-scale eutrophication in the great Barrier Reef Lagoon. Ambio. 1995;24:208-215. Khan MA, et al. Studies on plankton communities and primary production in meddle stretch of river Ganga in context of cultural eutrophication. J Inland Fish Soc. 1998;30:47-68. Sankaran Uk, et al. Limnology and eutrophication of Tawa reservoir, M.P. State, Central India. J Inland Fish Soc. 1998;30:13-23. Pauli D, et al. Eutrophication in Kaithkola Ox-Box Lake, North Bihar. J Inland Fish Soc India. 2003; 35:19-24. Hussain GA, et al. Eutrophication and management of Kashmir Himalayan Wular Lake, Kashmir. Indian J Environ & Ecoplan. 2010;17:335-342. Dale B, et al. Climate change and harmful algal blooms. Ecol Harmful Algae. 2006;189:367-378. Halder DP, et al. Effects of solar UV radiation on aquatic ecosystems and interactions with climate change. Photochem Photobiol Sci. 2007;6:267-285. Johnk KD, et al. Summer heatwaves promote blooms of harmful cyanobacteria. Glob Chang Biol. 2008;14:495-512. Chung EG, et al. Modeling linkages between sediment resuspension and water quality in a shallow, eutrophic, wind exposed lake. Ecol Model. 2009;220:1251-1265. Xia J, et al. Potential impacts and challenges of climate change on water quality and ecosystem: Case studies in representative rivers in China. J Resour Ecol. 2010;1:31-35. Su JQ, et al. Lake Eutrophication modelling in considering climatic factors change: A review. Chin J Appl Ecol. 2012;23:3197-3206. Wu F, et al. Influencing factors of lake eutrophication in China. Ecol Environ Sci. 2012;21:94-100. Valdemarsen T, et al. Organic N and P in eutrophic fjord sediments-Rates of mineralization and consequences for internal nutrient loading. Biogeosciences 2015;12:1765-1779. Singh RN, et al. Limnological relation of Indian Inland waters with special reference of algal blooms. Proc Internet Assoc Theor Appl Limn. 1956;12:831-836. Pillay TVR, et al. Aquaculture Principle and practices. Fishing New Books Oxford. 1993:1-575. Palmer CM, et al. Algae as biological indicator of pollution. Trans Seminar Biol Prob Water pollution Cincinati, Ohio, USA. 1957. Pieczynska E, et al. Ecological significance of macrophytes. Int J Ecol Environ Sci. 1976;2:115-128. Crowder AA, et al. Distribution, seasonality & biomass of aquatic macrophytes in lake Opinicon. Nautraliste Can. 1977;104:441-456. Pal RN, et al. Identification and control of commonly occurring diseases in fresh water aquaculture. Bull Aquaculture Ext Manual. 1985;9:1-23. Swingle HS, et al. Fish kills caused by phytoplankton blooms and their prevention. FAO Fish Rep. 1968;5:407-441. Barbus S, et al. Monitoring natural waters for drinking water quality. World Health Stat Q. 1986; 39:32-45. Rastogi RP, et al. Bloom Dynamics of Cyanobacteria and Their Toxins: Environmental Health Impacts and Mitigation Strategies. Front Microbiol. 2015;6:1-22. Trolle D, et al. Predicting the effects of climate change on trophic status of three morphologically varying lakes: Implications for lake restoration and management. Environ Model Softw. 2011; 26:354-370. Peperzak L, et al. Climate change and harmful algal blooms in the North Sea. Acta Oecol. 2003; 24:139-144. Stanichny S, et al. Wind impact on the Black Sea ecosystem. EGU General Assembly Vienna, Austria. 2010:1-2168. Ma W, et al. Analysis on designed wind field condition for pollution capacity calculation in a large scale shallow lake. J Hydraul Eng. 2009;40:1313-1319.